In Luisa Miller (1849) Verdi steers away from the historical dramas with noblemen and rulers and turns to the middle classes. Schiller’s Kabale und Liebe, which was the basis for Salvatore Cammarano’s libretto, may have been from another age too. It was written before the French revolution, a time when the bourgeoisie didn’t have any political rights, as Stefan Johansson points out in his deep probing booklet notes. By the mid-19th century things had radically changed and the audiences who frequented the opera houses were able to identify with the story. Luisa Miller paved the way for La traviata just a few years later, where we also meet a middle class society. Between those two operas there was the unsuccessful Stiffelio, with the protestant priest contemplating divorce due to his wife’s supposed infidelity. That situation was indigestible for Italian audiences in 1850, for obvious reasons, but Luisa Miller should have been a winner, considering not least the wonderful music. True, there is only one real hit, Rodolfo’s Quando le sere al placido - but this is one of his very best arias. The score practically overflows with catchy music, something which I discovered in the late 1960s when I bought the now legendary RCA recording at an LP sale. Not knowing the opera at all at the time, I was quite stunned by the riches on offer. Not only does Luisa have a splendid aria, so has her father. The latter is worthy to stand beside corresponding arias in many of his other operas. The basses are well treated too. Even Federica has some highlights, though she is a secondary character. No, the tragedy with Luisa Miller was that within a few years it was overshadowed by the trio of Rigoletto,Il trovatore and La traviata. After WW2 it has, however, been revived on many occasions. The bicentenary tempted several houses to look beyond the standard canon and they found Luisa a delectable alternative. 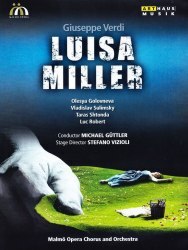 The Malmö Opera, in southernmost Sweden, with reputedly the biggest stage in northern Europe, regularly explores the byways and this Luisa Miller from 2012 is a worthy addition to the DVD catalogue of the opera. The production is clean, attractive, without hidden symbols - unless we count the first meeting with the innocent Luisa lying gracefully in a green pasture dotted with flowers. It’s all like a picture-book, but we soon see two gigantic hands holding this idyll, ready to crumble it to pieces and for ever change Luisa’s life. The devil wins, as so often, but not without losses. Count Walter, not one of opera’s blackest characters, loses his son, Federica loses a hypothetical husband. Neither of them is Satan personified, in that category the palm goes to Wurm, here portrayed by Lars Arvidson so repulsively, so in line with his name (Wurm = worm, snake) - the one who forever ruined Paradise. He sings well too and the same goes for the whole cast: The orchestra play well, the recorded sound is great but it is for the singing that this production is worth investing in. The Russian soprano Olesya Golovneva first made her mark at the Vienna State Opera as the Queen of the Night. Now she is gradually is moving on to more dramatic parts- Violetta in La traviata is her signature role. Here in Malmö she makes her debut as Luisa and she sings radiantly. Her last act aria is heavenly. The Canadian tenor Luc Robert, who was a good Faust in Tallinn in September 2012 is an eminently satisfying Rodolfo here. The lack of lyricism I felt there he delivers aplenty here, in particular in his nuanced reading of Quando le sere. Vladislav Sulimsky, a member of the Mariinsky ensemble since 2004, is a moving Miller and his arias are high-spots in this opera. The duet with Luisa in the last act is also loaded with emotion. The third East European singer in the cast, Taras Shtonda from the Ukraine, had been heard the previous year in Les contes d’Hoffmann in Malmö, the same year that I saw him as Gremin in Eugene Onegin in Oslo. He is here a mighty Count Walter. It’s a pity Federica’s role isn’t bigger when the strengths of Ivonne Fuchs are at hand but she makes the most of her opportunities. Those who want to know Luisa Miller should try to acquire the old RCA recording mentioned above with Moffo, Bergonzi, Verrett, MacNeil, Tozzi and Flagello. Unfortunately this is at present only available in a jumbo-box with Verdi operas but sooner or later it must be issued separately. While waiting for that - please Sony, take note - this DVD is a sure way of falling in love with one of Verdi’s most delectable scores.